In this Alysia Build Guide, we provide an overview of her strengths, abilities, Battlerites and matchups. Alysia is a ranged Champion that falls somewhere between Iva and Ashka. With a kit that revolves around Chill and Frozen effects, managing both - while keeping yourself alive - can prove challenging. Despite that, she’s undoubtedly incredibly potent and in many respects, exceeds the potency of her peers. From the frozen north comes the ice sculptor Alysia. Her power allows her to wield ice with both grace and deadly precision. She can damage and freeze her enemies from a distance, while shielding her allies with ice. Obsessed with shapes and form, she left her icy fortress of solitude to seek inspiration in the arena. What’s particularly interesting about Alysia, and partly why she’s so challenging to play, is the interaction between her abilities and the effects they cause. Not all cause Chill, and not all cause Frozen. Instead, you often have layer them in order to maximize their uptime. The result is a Champion which has difficult rotations and a high skill ceiling. Like most ranged Champions, Alysia is fairly easy to “tunnel” and is incredibly weak to repeated dive attacks. Even with effective use of her Chill and Frozen, she cannot kite and evade forever and still relies on her team for protection and peels. In the right hands, Alysia can be a powerful opponent and one that, at times, can be highly oppressive. Frozen Bolt (LMB) - Alysia’s basic attack allows her to deal moderate damage at a relatively fast pace. The key value in Frost Bolt isn’t just its steady numbers, but the fact it reapplies Chill to those already affected by it. For kiting enemies, keeping them slowed, and generally remaining a nuisance, it’s important to continually land these attacks against those suffering the debuff. Considering you gain bonus damage hitting those who are Chilled, it’s a core part of what gives Alysia her power to whittle down the enemy team. Ice Lance (RMB) - Acting similarly to Jade's Snipe, Ice Lance allows Alysia to release a high damage projectile from a long distance. Those struck who are already chilled suffer bonus damage, while those without are then slowed. It's incredibly important to land Ice Lance, not just for the damage but also the chill up-time. Be sure to cancel cast regularly to bait abilities, and aim for where the target is likely to be. It's often easy to avoid, so pairing it with Flash Freeze works well. Arctic Wind (Space) - A short range leap that acts as an i-frame, Arctic Wind is Alysia’s only form of default mobility. Outside of Arctic Wind, she has to rely on applying Chill, Frozen or her shielding in order to survive. That said, a well timed Arctic Wind can see Alysia kite fairly easily and avoid Champions such as Rook or Raigon. While this respite is brief, it does buy you enough time to apply your Chill, or to wait for another ability to come off cooldown. If you can, it’s also worth leaping over scenery where other Champions cannot follow you. Glacial Prism (Q) - When Arctic Wind isn’t available, Glacial Prism is your only form of defence. Like most shields it can also be cast on allies, not just yourself. Depending on the circumstance, you can use it aggressively to force the Chill effect upon explosion, allowing you to follow up with Flash Freeze, Snow Cone or Frozen Gallery. Just be conscious of the fact that if you do cast Glacial Prism on someone else, that leaves you very vulnerable when you’re without Arctic Wind. Be sure you can survive any potential pressure. Flash Freeze (E) - Flash Freeze is a fixed location ability that causes Chill where it’s cast. Though there’s a brief delay, in many ways it works similarly to Rook’s Boulder Toss in the sense you need to predict where players will be, and take account for the flight time. In this case, you’re anticipating where players will be once the damage occurs. Skilled players will avoid Flash Freeze with relative ease, so it’s important for you to use it when you know enemies are unable to move, or have used their “outs”. Flash Freeze also works particularly well at zoning the enemy, and can prove incredibly strong in confined areas. Ice Crown (R) - Ice Crowns value isn’t immediately apparent and yet it’s one of Alysia’s strongest abilities. Creating a barrier between her and her opponents, it not only offers a slight knock-back, but also explodes if it’s damaged. Against a Champion such as Rook, it can stop their Rush at you immediately. Alternatively, it can block ranged projectiles or simply act as an object you can move around while waiting on ccooldowns. I’ve found it particularly useful when being chased by Champions such as Croak or Raigon, and while you won’t use it all the time, use at key times will see it save your life. Ice Block (Shift + Q) - Ice Block allows Alysia to place herself or an ally in stasis, gaining a shield and recovering health. When under heavy pressure, the mitigation is huge and will save you far better than just Glacial Prism. Just be aware that as you're stationary, you're then vulnerable when the Ice Block ends or breaks. Have Arctic Wind ready to leap away, or have your team peel for you. Snow Cone (Shift + E) - Snow Cone is an incredibly powerful ability that allows Alysia to hit multiple enemies at once. Causing Chill and eventually Frozen, it’s potent and deals high damage. With the right Battlerites, Snowcone can facilitate one of Alysia’s highest burst rotations, allowing her to break the Frozen effect (while bypassing the shielding it affords), to then continue damaging enemies. If nothing else, Snow Cone works amazing for kiting opponents or buying time from its potential Frozen effect. Just be aware that if you do use Snowcone, you can’t then follow up with Frozen Gallery. Frozen Gallery (F) - Frozen Gallery is an incredible Ultimate. Not only does it deal instant damage, but also Freezes all enemies hit. Considering this then gives you a free opportunity to escape, or deal damage (see Battlerites below), it's partly the reason why Alysia is so strong. Used in a confined space, or against low health Champions, you can often clean up when it's ready. Cryogenic Lance allows Alysia to increase the duration of her Chill, and cause her Ice Lance to explode causing the effect to all those around it. Having the ability to apply Chill to multiple foes ensures that Arctic Wind can freeze multiple foes, or to simply allow Alysia to kite that little bit easier. By default, any enemy who is Frozen receives a significant shield. This is designed to prevent Alysia bursting down enemies who can't move (similar to Petrify). However, Ice Breaker allows Alysia to bypass this by allowing Ice Lance to remove the shield, and THEN cause damage. What's so strong about this is the fact players who are Frozen cannot move until they suffer the damage, with Ice Breaker allowing Alysia to achieve her highest damage rotations. At the very least, and if Ice Lance is off cooldown, a Frozen enemy is going to suffer at least 25 damage. Allowing Alysia to Chill an enemy she leaps away from, Frost Nova causes a much needed root on melee Champions attempting to catch her, but also then allows her to follow up with Ice Lance for its bonus damage. There's also the potential to land Flash Freeze against those who're chilled to cause the Frozen effect. Figure Skating provides Alysia with Haste for 1.4 seconds when she uses Glacial Prism. Considering she's so easy to tunnel, it provides some much needed mobility and ensures she can escape when needed. Snownstorm builds on Flash Freeze, allowing it to deal more damage while also inflicting Chill over a longer period. Anyone caught in the radius of Flash Freeze will take a fair amount of damage, and when eventually Frozen, will suffer even more thanks to Ice Breaker (above) if you land Ice Lance. These Hero Threat Levels (1 being lowest threat and 10 being highest threat) are to help you determine which enemy Heroes can give you a headache. For the Heroes listed here, take extra care as they're particularly dangerous for Alysia. Ezmo: His speed, rapid attacks, ability to shield himself and his long ranged poke allows him to avoid your abilities, and land his. 2. The second is Glacial Prism > Frost Bolt > Snow Cone > Ice Lane > Frost Bolt. Both of these are capable of instantly lopping off almost 100 health with the above build. 3. Remember that your basic attack, Frost Bolt, doesn't cause Chill. It only elongates the duration when an enemy Champion is already suffering the effect. 4. Chill's duration is a maximum of 4 seconds, with each attack you land with Frost Bolt reapplying this. 5. Chill from any ability, not just reapplied through Frost Bolt, slows enemies by 20%. 7. Ice Lance deals more damage to an enemy already suffering Chill. Using Glacial Prism and its explosion (which causes Chill), Flash Freeze or Snow Cone, before hitting them with Ice Lance, allows for Alysia's highest single target ability. 8. At 22 damage per Ice Lance (without Chill bonus), Ice Lance isn't amazing at stealing the central Orb (Energy Rune). However, its projectile speed does allow you to snag it if you get the Energy Rune low enough. 9. Arctic Wind has a lengthy cooldown, but as your only i-frame it's arguably more important than Glacial Prism. Use it only when you'd suffer a lot of damage (such as when Rook is using Rush against you). 11. Glacial Prism is primarily for defence, but it can be used aggressively: it offers an instant Chill effect once it explodes, allowing you to setup your strongest rotations (see tips 1 and 2). 12. Ice Block provides you with healing over time, and a huge shield. Use this to buy yourself time when under massive pressure. Just be prepared to leap away the moment it ends. 13. Always use Ice Block on an ally who's under a lot of pressure. If the enemy choose to continue to attack them, you're then free to attack with impunity, or secure the Energy Rune. 14. I'd argue Snow Cone is best used against a large group of players, but 1 on 1 it's ideal for a gaurenteed quick Freeze when under heavy pressure. 15. 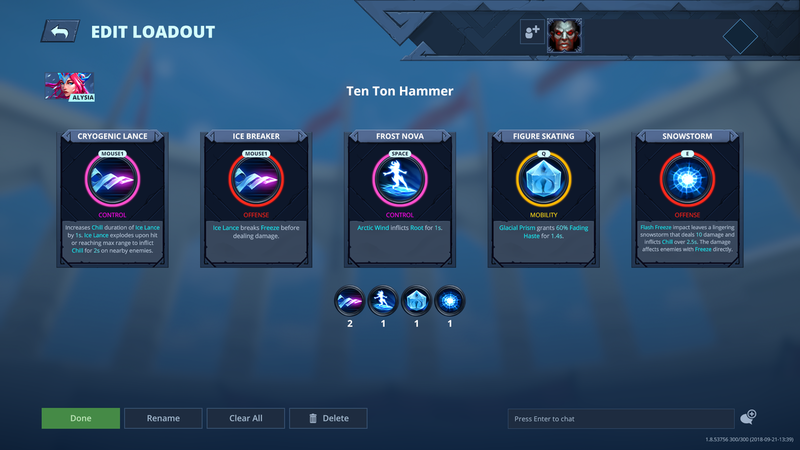 If an enemy player is low health, remember that Frozen Gallery deals 35 damage and your Battlerites allow you to bypass its Frozen shielding to then land an Ice Lance. In most cases, it can ensure a kill.